When contacting us please let us know what it is you are looking for, as well as a bit about yourself. Try to cover all these topics in your email, plus add any information you think we should know. Please feel free to ask any questions you might have. Are you looking for a companion or something to show or breed? Do you want a female or a male kitten? What colour preferences do you have? 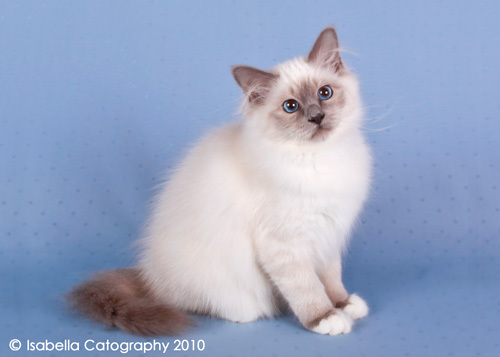 Have you ever owned a Birman before or know much about the breed? Would you be picking up your kitten or would shipping be required? After we have a kitten available for you, and it is everything you were hoping for and more, a deposit will be required. Deposits are not accepted until the kittens are over 2 weeks of age, as we like to ensure our kittens are growing up nicely. Our deposits are $150.00 and are non-refundable and non-transferable. 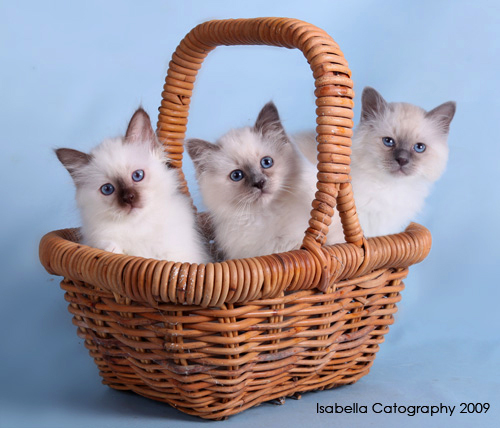 Once you place a deposit for a specific kitten, you cannot change to another in that litter or a later litter and hold it with the original deposit. If you no longer wish for that kitten, the deposit will be lost. The only way a deposit will be refunded is, if we at Damukyan deem the situation to warrant it, or if something on our end changes. Ms Gisette our lovely blue kitten who now lives in Belgium.